North Sannox pony trekking is a family run trekking centre on a working hill sheep farm on the north east of the Isle of Arran, established in 1981. 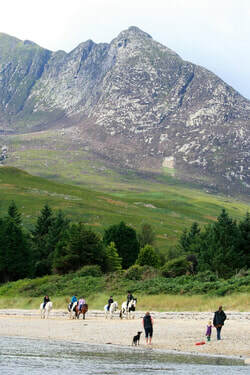 Horse riding is one of many outdoor activities available on Arran. Complete beginners are very welcome. All the horses and ponies are suitable for beginners as well as the more experienced rider. Treks have a lower age limit of 5 years old. There are paddock rides available for 3-5 year olds. North Sannox Pony Trekking, North Sannox Farm, Isle of Arran, KA27 8JD.